These fall lawn care tips will ensure a healthier spring lawn. There is still time to take the necessary steps to make your lawn the lush, green envy of your neighborhood next Spring. Even though the weather has started to cool down and the hot summer days have gone, you should still maintain a target of 1″ of water applied to your lawn each week (via rain or hose). Be sure to keep this level of moisture through the month of October at least. You can lower the blade on your lawnmower too, keep the lawn at least 2″ high though and maintain a regular lawn-mowing schedule. The vast majority of lawns in the DuPage County area are made up of these common cool-season turf grasses including: bluegrass, bentgrass, fescues, and ryegrass. All of these grasses will benefit from a fall winterizing fertilizer prior to winter. In our area, it would be best to use a winterizing fertilizer (with weed control) prior to mid-October. Look for a high-nitrogen fertilizer at the local Home Depot, Menards, or hardware store. Apply as directed on the package. 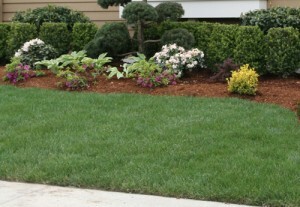 Having fertilized in the fall, you will have less weed germination and a greener lawn in the spring. Fall weather is usually great for overseeding and patching-up an existing lawn. The temperature and rainfall generally allow for quick germination of grass seed. You’ll want to get your overseeding done before temperatures are consistently below 50-degrees during the daytime. Be sure to prepare your lawn for overseeding; don’t just toss seed all over your lawn and expect great results – preperation goes a long way here. Start by raking (I recommend using a thatch-rake) the existing lawn. Next, get a supply of topsoil (bags are fine) and distribute that over your existing lawn. Now, sow the grass seed by hand or using a hand-crank spreader. Be sure to finish overseeding with a good watering to set the seed into the new topsoil. This is one of the most beneficial fall tasks you can perform to ensure the health and vitality of your lawn. Either pay a service, or rent a core aerator from a local equipment rental company. Either way, I prefer an aerator that pulls out dirt plugs from your lawn (as opposed to one that simply pokes holes in the ground). Aerating allows for better root growth and absorbtion of fertilizer, water, and oxygen. When your lawn becomes too compacted, roots cannot spread and grass colony growth is stunted. This is another very beneficial task you can perform on your lawn. Overtime, dead grass and roots begin to form a layer of thatch close to the lawn’s base. Thatch can limit oxygen, sunlight, and nutrient absorbtion. You can rent a power-rake dethatcher or have a local lawn service do this for you. Another option is to purchase a dethatching rake (usually available at local home improvement stores)… I must warn you though, manually dethatching your lawn is a heck of a workout. Get outside and enjoy the fall weather and get your lawn looking the way you’ve always dreamed it could.